Welcome to Gilbert - the martial arts capital of Arizona located in Maricopa County. In Gilbert, one will find many martial arts schools - almost one in every corner mall. Even though the town is filled with sport martial arts schools, McDojo and related schools, a few traditional martial arts dojo, the cream of the crop, exist - one just has to find them. Traditional schools provide historical and philosophical education in the 'way' of martial arts - known as budo and bujutsu and teach respect, ethics. The 2010 census reports Gilbert has a population of 208,453 according to wikipedia. The town of Gilbert also has public and private schools, churches, gymnasiums and Chandler-Gilbert Community College - some of which may house a some martial arts programs. There is also Freestone Community Center, McQueen Park and Gilbert Community Center. Some larger Christian Churches in the community have campuses or large meeting rooms, and some have martial arts outreach programs. Some large churches in the area include Central, Life Link, Grove, and Love of Christ. Other martial arts schools may train at various gymnasiums such as Lifetime, 24-hour, LA Fitness, YMCA, Boys Clubs, etc. If there is a gym, there is a possibility for martial arts classes. The majority of traditional martial arts schools and classes will likely be found in gymnasiums as these types of schools are designed to teach the discipline and respect of the traditional martial arts. Those traditional martial arts include non-sport arts such as traditional Japanese jujutsu, aikido, kyudo, iaido, kenjutsu, aikijutsu and the Okinawan forms of karate, kobudo, karatejutsu, kobujutsu and toide. The competitive martial arts can include kempo, karate, judo (although very uncommon, there are schools of traditional judo), competitive jujutsu, kendo. Although MMA is not a martial art, there are many mall-front schools that advertise MMA. To the novice, all of these martial arts may seem similar - but to the initiated, there are important differences. For example, we came across a discussion on the differences between traditional and sport karate that we highly recommend for reading, as it should help decide if you want to learn traditional martial arts for self-defense, or train for trophies. Another site, an extensive blog, gives a lot of insight on choosing a martial arts school and instructor. Things a martial artist needs to be aware of is State Laws on martial arts and weapons, such as deadly force, possessing nunchaku (a very questionable law) or possessing brass knuckles. A person can carry a sword, gun, etc., but not a pair of sticks, even if they look like nunchuks such as those plastic ones kids buy at toy stores, or foam rubber from martial arts outlets. California, Michigan, Illinois and Vermont prohibit the possession of brass knuckles and devices that look like brass knuckles. In South Carolina, it is reported using brass knuckles with intent to commit a crime is illegal according to the website FindLaw. Does this include tekko? I have no idea, as some tekko are simply horse shoes and as far as I'm aware, government has not yet outlawed horse shoes or stirrups (but I wouldn't hold my breath). Then there is hand registration. Do you have to have your hands registered at the police department, etc? Of course not, but we highly recommend that you stop by your local police department as ask about the laws in your area. Most traditional martial arts are taught by well-trained and certified martial artists, as are many sport martial arts. But, the MMA and the McDojo groups have questionable martial arts instructors and it is highly recommended you check the background of the dojo and the instructor by searching the internet. It only takes a few minutes and it may save you a lot of money and grief in the long run. Schools, gyms and even churches that employ or rent time to a martial arts group should also be checked. Just because a martial arts instructor attends church doesn't mean that he doesn't have something to hide. The City of Gilbert doesn't allow martial arts groups to rent and train in industrial buildings or centers. This is sad as most traditional martial artists do not offer contracts and do not teach kids making it difficult to pay rent along with their martial arts association fees and insurance. So, why don't they just start teaching kids? It has always been traditional to only teach martial arts to those 16 years old and older - kids are fragile and have growth platelets which can be damaged particularly in the throwing arts such as judo, jujutsu and aikido. Sport martial arts and McDojos are primarily interested in contracts and look to sign a person to a 1 or 2 year contract - some even offer lifetime memberships. But remember, there is little to protect you from the school closing or relocating and sending out bill collectors to acquire the remaining contract even though the school may no longer exist, or may have moved to Las Vegas - read your contract! Just watch the martial arts schools down the block from your home. Most have a lifetime expectancy of 3 years - this is because most lease agreements are 3-years. At the end of the 3-years, few survive (probably less than 20% survive) and move on. This is also true of gyms. A gym can move, or the martial arts class in the gym could move as most of these pay month to month rent. Gilbert Arizona requires martial arts schools to lease commercial buildings rather than industrial buildings, which can be 2 to 4 times greater in rent thus making it almost impossible for any martial arts group to survive. But this is not the same for a gymnasium! But, "Dojo" is a Japanese word that translates as "GYM". Yet, the Gilbert city government doesn't regulate basketball or volleyball gyms to commercial buildings. So, why should it require karate or jujutsu gyms to pay high rent? Ask you representative as to why they are over-regulating the martial arts industry in Gilbert and in the state? Give them a call. One Gilbert Martial Arts School offers traditional instruction in Karate, Kobudo (Okinawan weapons), Samurai Arts, Self-Defense and more. 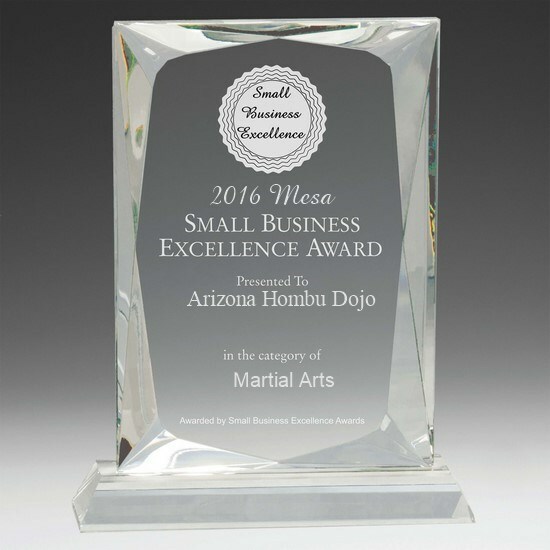 The Arizona School of Traditional Karate, also known as the Arizona Hombu, focuses on traditional Okinawan Shorin-Ryu Karate and Kobudo and teaching these original martial arts in Gilbert, Arizona. The variety of kobudo at this martial arts center is second to none and students learn everything from a pen to a 6-foot staff for self defense. Recently, the school and its instructor were featured in the Thumbtack Spotlight. The training does not stop there - this is because of the well-rounded Gilbert martial arts instructors at the karate school. Soke Hausel, grandmaster of Shorin-Ryu Karate, has 5 decades of experience, more than 2 dozen certifications in martial arts and he is joined by the talented martial arts master Dai-Shihan (master) Neal Adam (PhD) and instructors Sensei Paula Borea, Sensei Bill Borea, Sensei Ryan Harden and Sensei Patrick Scofield. 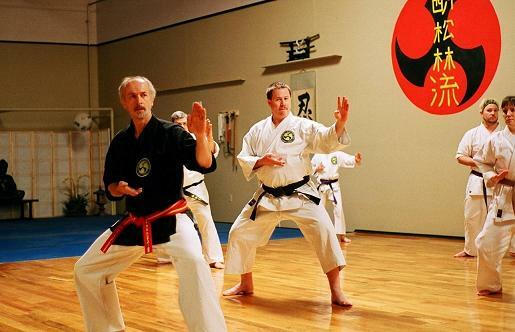 In addition to teaching concepts and traditions of Shorin-Ryu Karate and Kobudo, students at the school also have the opportunity to train in samurai arts and self-defense techniques. And if this is not enough, each June, all of the students are invited to attend Juko Kai national clinic in New Braunfels, Texas and train in other martial arts. The school reports that it is a ryu (family) of martial artists looking for new friends and martial artists to train in traditional karate. People are invited to stop by the Gilbert martial arts school. Heather From attacks Chase during Kenjutsu class (samurai sword). Luis and Todd train with hanbo at the Gilbert Karate School. weapon - hoe (kuwa) in Gilbert. Shorin-Ryu Karate training - Dr. Adam attacks Dr. Bergkamp at the Arizona School of Traditional Karate on Baseline Road, Gilbert, Arizona. Adam trains with sai during kobudo classes in Gilbert. Soke Hausel trains members of Seiyo No Shorin-Ryu Karate Kobudo Kai in Murray, Utah. Dr. Teule trains in samurai arts. The Arizona School of Traditional Karate is a unique martial arts school on the border of Gilbert and Mesa, that focuses on the traditional Okinawan martial arts along with traditional Japanese martial arts. A wonderful group of adults and families who are all waiting to meet more positive members. The student body includes engineers, teachers, scientists, professors, lawyers, electricians, accountants, doctors, priests and more. A summary from two students at the Arizona School of Traditional Karate on the border of Gilbert and Mesa (60 W. Baseline Road). We read about the Arizona School of Traditional Karate and found it was associated with international martial arts associations including Seiyo Kai International, Zen Kokusai Soke Budo Bugei Renmei and Juko Kai International. We first stopped by the school and were very impressed by the extensive curriculum of training from the lowest white belt to the highest level of black belt. It was apparent, one could spend a lifetime trying to learn all of the martial arts taught in this one incredible, traditional school. We couldn't wait to get started. When we signed up for classes, we were a little nervous but our nerves soon faded after we met Soke Hausel and all of the students and other martial arts instructors. All of the adults were great explaining that the group was more like a club or a family than a trophy factory (that's right, they do not train for tournaments). We started training in traditional Shorin-Ryu Karate and after about 20 minutes, Soke Hausel broke the group up and all of the white belts went to the far end of the dojo - one night we trained with Shihan (master) Neal Adam, a professor of biology at Grand Canyon University and other nights we trained with Sensei Bill Borea (a retired air force pilot) and Sensei Paula Borea, a real live samurai from Japan. As we progressed, our time with Soke Hausel grew and we found we were learning martial arts at leaps and bounds. The classes were broken up so that Tuesday evenings, we trained in kata. We really enjoy kata and found these were forms that include many basic and advanced techniques. By practicing katas over and over, we achieved muscle memory and learned many self-defense techniques. Wednesdays we learn a lot of self defense. We learned to defend against knife attacks, guns, rifles, clubs and people in general. This was followed by samurai training that included using a samurai sword (always wanted to learn to use one), naginata (polearm) and other weapons. Thursdays are our favorite nights. We train in Okinawan weapons known in Japanese as kobudo. These are tools of trade of Okinawan fishermen and farmers. We found we could apply this to the tools in our garage - rakes, hoes, hammers, etc. It turned out to be very practical. After this class, we trained with a hanbo (3-foot stick). This was great! We also discovered that the school offers periodic clinics. Now get this. We pay for all of our classes at the beginning of the month and their are no contracts. Over the weekend in May 2013, we got to train at a special Friday evening and all day Saturday clinic with a bunch of martial artists from our school in the East Valley as well as a group of fun black and brown belts who flew in from Utah for training. Most places might charge $500 or more for a special clinic like this - we paid nothing! It was included as part of our normal training. We were shocked. Anyone interested in training in traditional martial arts would be crazy not to try this school in Gilbert. We are so happy that we found this place! And thank you Soke and thanks to all of the friends we have made over the past year. Sensei Paula (of Japanese samurai heritage) trains with her husband O'Sensei Bill (retired air force pilot). attend the clinic and train in Juko Ryu Kijutsu. Its not every day that a blog receives international recognition and Web Award for content. So we were quite happy to wake up and find that the Gilbert Karate blog was recognized by Snippet.com for its informative content on karate and more specifically on Gilbert Karate. This Blog was deemed by Snippet as a reliable source for trustworthy content and we were thus awarded for its content on Gilbert Karate. The Gilbert Martial Arts School works to not only educate its student body on karate, martial arts in general, and about the history and philosophy of martial arts, but it also offers one of the more diversified traditional martial arts programs in the country. The karate school is located on Baseline Road just two stop lights east of Country Club Road on the corner of McDonald and baseline. The karate school offers quality Martial arts and karate instruction with a Hall-of-Fame Martial arts instructor & national and international instructor of the year along with instructors from Chandler, Gilbert, Mesa and Phoenix. For the best in Adult & family martial arts, the traditional karate school is hard to beat. 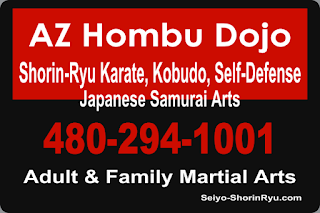 At the Arizona School of Traditional Karate, the Hombu (world martial arts headquarters) for Seiyo No Shorin-Ryu Karate Renmei, you learn basics of karate, self-defense, samurai arts and kobudo (Okinawan martial arts weapons). SnippetFact.com is a continuously improving project focused on creating a trustworthy 'facts only' based website. Founded by a community who enjoy to learn and who are dedicated to improving their own intelligence, whilst helping the quality of online factual content progress. Traditional Karate and Kobudo at the Arizona School of Traditional Karate. Students at the Arizona School of Traditional Okinawa Martial Arts enjoy training in classes taught by Soke Hausel, a member of the Gilbert Community and Hall-of-Fame martial arts instructor and geologist. Soke Hausel, a polymath, is a grandmaster of Shorin-Ryu Karate and Kobudo (西洋少林流空手道) but is also known for his geology, books, lectures on martial arts and geology, astronomy and art. The training regimen students receive at the Arizona School of Traditional Karate on Baseline at MacDonald, is superior to most schools according to the students. The Karate Classes in Gilbert are open to adults and families. The martial arts school is located at 60 W. Baseline Road on the border of Gilbert and Mesa. Students from all over Phoenix Valley train at the school each week. Others periodically travel great distances to train under the hall-of-fame martial artist for a few days or a few weeks. Over the past few years, students have traveled from Massachusetts, Utah, Wyoming, Florida, Switzerland, India with other members from India, Vietnam and Greece planning to travel to the Arizona martial arts school in the near future. Many like training at the Gilbert martial arts school because of the Okinawan decor. They also are impressed by the extensive background of their martial arts instructor who has been training since the mid-1960s in many different martial arts and has certifications in 23 martial arts. Soke Hausel was inducted into several Halls of Fame for martial arts as well as a two Halls-of-Fame for contributions to geological sciences and education, making him one of the few in the world who is a member of several halls-of-fame. His extensive background in martial arts equates to a superior martial arts education for his students. A 12th degree black belt in Shorin-Ryu Karate and Kobudo as well as black belts in some other arts as well as Shihan ranks (master instructor) in four martial arts. He even holds a black belt rank in a secret art that involves Shitai Kori (body hardening). Only traditional Okinawan-Japanese martial arts are taught at the school. This means there is no competition. When karate was created on Okinawa, it was kept secret from all outsiders. Karate was developed only for self-defense and self-improvement and never meant to be a sport. To train in karate, one had to swear an oath of secrecy. This worked so well that karate had been practiced for at least 3 centuries on Okinawa right in front of a Japanese occupation force, and no outsider had any idea it existed until was introduced to the world by two famous Okinawan martial artists - Shihan Anko Itosu (糸洲 安恒) (1831-1915) and Shihan Gichin Funakoshi (船越 義珍) (1868-1957) at the beginning of the 20th century. 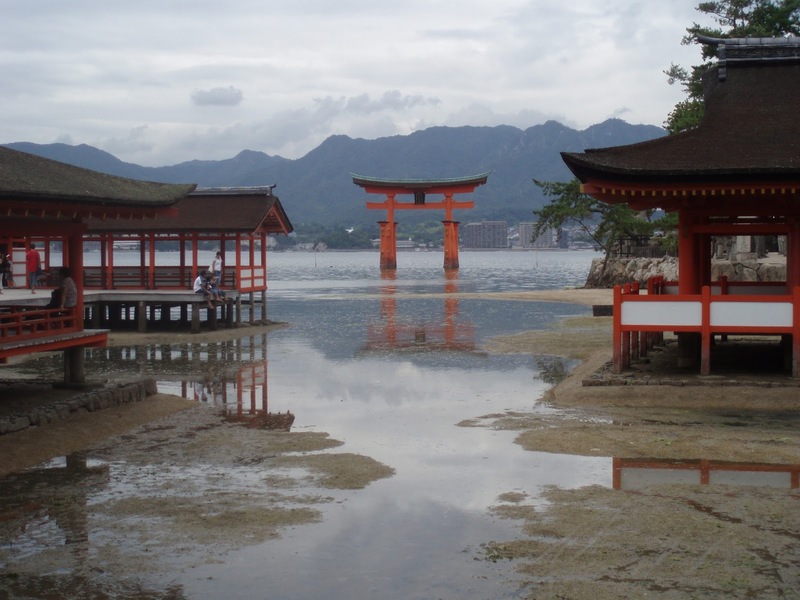 Being that Okinawa was assimilated by the Japanese, the Japanese were exposed to karate only after its introduction to the school systems on Okinawa and later Japan. Many Okinawans now wish it would have been kept secret because of perceived abuse by outsiders. First the Japanese modified the combat art into sport at the objections of Okinawan karate masters, and then others (notably Americans) modified it into dance-like competitions with brightly colored uniforms, glitter, twirling and gymnastics - making a mockery of the original art designed for empty hand self-defense (known as karate) and weapons (known as kobudo). We can gain insight into the original form of Shorin-Ryu Karate and Kobudo by reading some concepts by some great shorin-ryu masters and grandmasters. Gichin Funakoshi wrote, "The purpose of Karate Lies not in defeat or victory, but in the perfection of its participants". Shoshin Nagamine (長嶺 将真) (1907-1997), Grandmaster of Matsubayashi Shorin-Ryu Karate wrote, "if there is no kata, there is no karate, just kicking & punching", in reference to the direction some so-called martial arts were taking, such as MMA. He also wrote, "One must embrace a mu gen proverb that there can be no end to learning and that karate begins and ends with the study of kata". Shorin-Ryu Karate, the art taught at the martial arts school on Baseline, is based on shaolin kung fu. "Shorin" translates from Japanese as "Shaolin". It was modified from kung fu and includes very unique techniques of White Crane known as hakutsuru. Hakutsuru is based on the movements and actions of white cranes and is thought to have been developed by a female Chinese martial artist before being adapted to karate on Okinawa. It is such a unique, powerful and complex martial art that few Okinawan martial arts instructors teach it to anyone other than their most trusted students. Kobudo at the martial arts school in the East Valley of Phoenix includes many martial arts weapons as well as modern tools. Kobudo is thought to have been created by on Okinawa in the 15th century after king of Okinawa - Shoshin, decided to outlaw bladed weapons. This left Okinawa without any standing army to defend itself; thus the peasants began to arm themselves in secret using tools of trade from fishing and farming. On Okinawa karate and kobudo have been combined as one art for centuries even though most Japanese and American martial arts neglect kobudo. In the context of martial art, ryu in Shorin-Ryu translates as system, or style. But it is much more. Ryu also implies family. 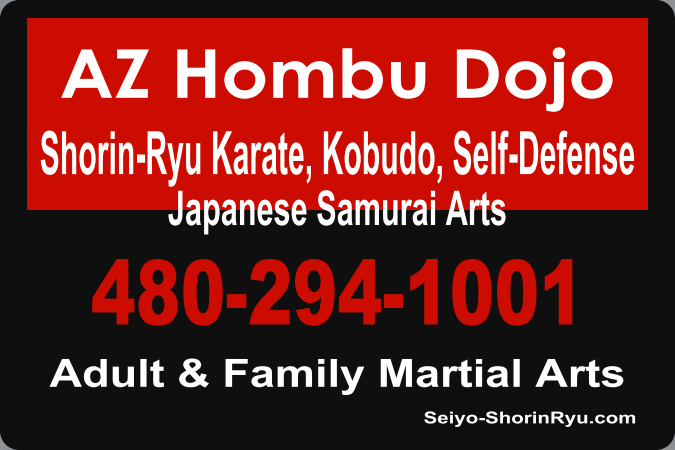 So members who train at the Arizona Hombu can be likened to an adopted family of martial artists led by a Soke (Head of Family). It is encouraged to make close friends in the dojo similar to members of a family - meeting each other for additional training, talking about martial arts at the local coffee house, etc.. Many martial artists in a traditional Okinawan Karate & Kobudo become friends for life. The ryu is officially known as Shorin-Ryu Karate & Kobudo. The branch of Shorin-Ryu that we study is known as Seiyo-Ryu. It is govern by Seiyo No Shorin-Ryu Karate Renmei also known as Seiyo No Shorin-Ryu Karate Kobudo Kai, or Seiyo No Shorin-Ryu Budo Bugei Renmei. The Soke is the head of the ryu and educator of all members. Because of this position, the Soke can only be a friend at a distance. When a new member signs up for classes, they are greeted by all dojo members. Utah Shorin-Kai members at special training at the Arizona Hombu Dojo in Mesa across the street from Gilbert, Arizona. We feel it is important to reach out to offer martial arts to the public. Why? Take a look at Japan. The Japanese have a relatively low crime rate compared to the United States. Part of this is due to the Japanese culture and part due to a large segment of the population having trained in martial arts. Not only does traditional martial arts teach non-violence, commitment and integrity; but when much of the population is armed, it acts as a deterrent. We offer special self-defense classes to the public and this year have added a new program - NEIGHBORHOOD SELF-DEFENSE Clinics. These clinics are 2 hours and only require a minimum of 6 people to sign up. The clinic attendees are taught pragmatic self-defense that includes escape techniques, use of tools as weapons (such as a pen, car keys, magazine, etc). Soke taught more than a hundred self-defense clinics and classes over the years to a variety of groups including martial artists, martial arts school owners, EMT groups, military, university faculty, university students and staff, librarians, church groups, sororities, women's clubs, girl scouts, scientific organizations, etc. In addition to weekly training in traditional karate, kobudo (martial arts weapons), self-defense and samurai arts, the school has received visitors by martial artists from Utah, Wyoming, India, Switzerland, Nebraska and Colorado. In 2012-13, Soke was inducted into Who's Who in America (2012, 2013), Who's Who in the World (2012) and Action Martial Arts Magazine Hall of Honors (2012). Shihan Adam (5th dan) another martial arts instructor, was promoted to full professor at Grand Canyon University, and Sempai W. Borea and Sempai P. Borea were both promoted to Sensei (teacher) in 2012. The weekly training schedule at our dojo at 60 W. Baseline Road is posted on our websites including our Arizona School of Traditional Okinawa Martial Arts site. ﻿﻿FOX 10 news recently aired a program about two Arizona Grandparents receiving 2nd degree black belts in Shorin-Ryu Karate. The news team stopped by the Borea’s house in Gilbert and then moved onto the martial arts school to film for about 3 hours before whittling the tape down to 3 minutes. They did a great job (other than forgetting to mention the location of the school). Dr. Adam practices kobudo with Rich. Here they use a bo (staff) and tonfa.